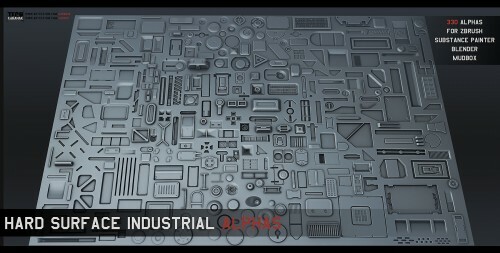 ArtStation Marketplace - 330 Hard Surface Industrial Alphas | Free eBooks Download - EBOOKEE! A complete pack 320 hard surface alphas for ZBrush/Substance painter. The alphas in this pack are a mix of small details and simple large extruded and recessed forms. They're intended to be used together to quickly detail large flat surfaces and make mechanical detailing quicker and easier. Available for download in .jpg, .png, .tiff, and .psd formats. For best quality, use .tiff or .psd. No comments for "ArtStation Marketplace - 330 Hard Surface Industrial Alphas".